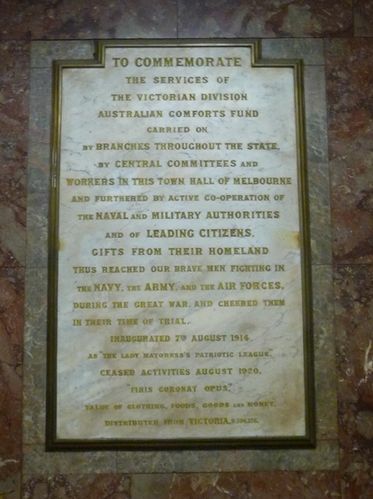 Marble plaque commemorates the activities of the Victorian Division of the Australian Comforts Fund during World War One. The Services Of The Victorian Division Australian Comforts Fund Carried On By Branches Throughout The State, By Central Committees And Workers In This Town Hall Of Melbourne And Furthered By Active Co-Operation Of The Naval And Military Authorities And Of Leading Citizens. Gifts From Their Homeland Thus Reached Our Brave Men Fighting In The Navy, The Army, And The Air Forces, During The Great War And Cheered Them In Their Time Of Trial. As "The Lady Mayoress`s Patriotic League"